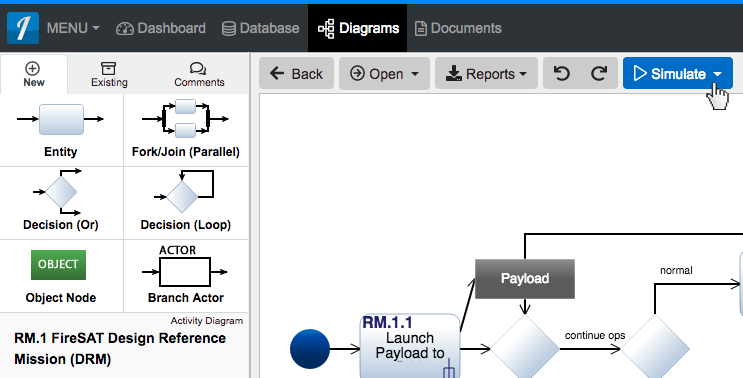 Within an 'Activity Diagram' locate the 'Simulate' dropdown in the toolbar. Click to open the 'Simulate' dropdown and select either the 'Monte Carlo' or 'Discrete Event' menu item to be navigated to the respective simulation tool where you can simulate your model. Within an ‘Activity Diagram‘ locate the ‘Simulate’ dropdown in the toolbar. Click to open the ‘Simulate’ dropdown and select either the ‘Monte Carlo’ or ‘Discrete Event’ menu item to be navigated to the respective simulation tool where you can simulate your model.